The urbanist in me analyzes interventions like the skywalks using three primary criteria: effect on the public realm, effect on the pedestrian experience, and effect on the physical environment. Downtown Skywalk at Hotel Fort Des MoinesCities have been giving up on the street as a public space since the invention of the enclosed shopping mall. We have grown content to cede this formerly public space to cars. Where once a downtown street was the stage upon which the dance of daily commerce took place, it is often now a utilitarian space dedicated to storage and movement of automobiles, largely devoid of pedestrian energy. Both the people and the incidental commerce that follows them (restaurants, barber shops, etc) have detached from the street and migrated into private and semi-public locations like malls and skywalks. Perhaps the skywalk is simply a physical manifestation of this shift in priority. Perhaps it is a cause. Either way, it represents a fundamental change in the pedestrian experience from the public realm of the street to the quasi-private realm of the skywalk system - the "malling" of downtown. We now pay to maintain redundant paths of travel between buildings - the skywalks pull huge amounts of money that might otherwise go towards improving the pedestrian experience a the street level. As a result, the public realm leaves much to be desired. Once a week for several Saturday hours, the Downtown Farmers' Market transforms the street back into a public place (though understandably, the market takes place on Court, just beyond the end of the skywalk system where the tubes dump out onto the street). The streets are closed to cars, and pedestrians claim the asphalt for their own. Sadly, this is an "event" rather than the norm. We understand that when the barricades go up, that the street is available for the public to inhabit for a short time. We do still love walking along the streets when they are designed to make the pedestrian experience pleasant, when there are things to look at, and reasons to do so. 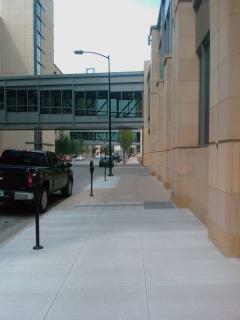 A trip through the skywalks is perhaps the most banal experience Downtown Des Moines has to offer. There is a huge perceptual difference between walking through the main entrance of an office building into a grand foyer, and walking from a parking garage directly into a beige second-floor elevator lobby. Entering a building through the skywalk system is akin to forcing houseguests enter your home through the bathroom. The pedestrian experience in the skywalks is framed by 10 foot window openings. It is hard to walk through the skywalks and feel like you are a part of something vibrant and lively - there is a utilitarian, orthodox feel to the journey. I think there is something worth preserving about the process of exiting a building onto the street - the journey to lunch or an errand has a defined beginning, middle and end. This sense is heightened in the winter when the journey starts with putting on a heavy coat and concludes with a puff of warm air when you open up the door at your destination. It's impossible to step into a skywalk for a breath of fresh air! Downtown Skywalk at Hotel Fort Des MoinesA mall puts huge amounts of money and thought into the environment between stores: fountains, benches, plants, displays, carts, and play areas all designed to convince shoppers to linger. A well designed public street does exactly the same thing. With a few exceptions, the skywalks do just the opposite. A utilitarian construct, they facilitate movement from source to destination as fast as possible, bypassing the pedestrian experience. Skywalks have several negative impacts on the built environment. Skywalks destroy pedestrians' ability to experience buildings from the street level. When the skywalks are stuck to the building exteriors (parallel to the building, and on top of the sidewalk) they create a "tunnel" effect that prevents pedestrians on the street level from looking up. When they cross the street they slice through the vertical experience of a true urban downtown street. 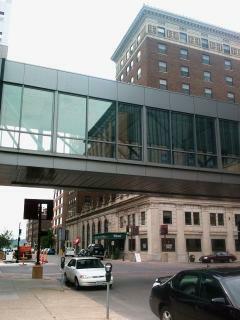 As an overlay system, the skywalks are not architecturally integrated with existing buildings. The skywalks are essentially an afterthought, and most of them look as if they were tacked on to existing buildings. For the most part, the designs are dated. The original skywalk system was constructed in the 1980s and design sensibilities have changed since then. Architectural elements that were state of the art 20 years ago now lend a kind of ticky-tacky feel to the whole thing. There is no easy solution at this point. Simply pulling down the entire skywalk system isn't feasible. Many of the buildings that line the streets weren't design to support street-level retail (a topic for another post). Downtown businesses, visitors, and residents are accustomed to the benefits provided by the skywalks, and perhaps inoculated against the negative effects. Because the skywalks are such a massive intervention, the solution is probably incremental reversal. The first step is for the City government to decide at a policy level that reclaiming the street as a critical element of the public realm is important. This recognition would inform a variety of subsequent actions: a use and impact study of the existing system, incentives for existing buildings to redevelop street level retail, and a long term plan for bringing the skywalks down, additional funding for streetscape improvements, improving mass transit options, etc. Of course, I don't kid myself that this will ever happen. Perhaps it would be more realistic to push for a moratorium on new and rebuilding of existing skywalks. Over time, they would come down in an organic manner. The future is in pedestrian-oriented downtown development.